John Ross Ewing has gotten himself into a Texas-sized fix. July 18 – The Dallas police department spent a lot of time on Southfork in this episode, which saw the culmination of a simmering plotline that set another in motion. Christopher is reminded of how he and Elena were cheated out of a life together when he comes across the tree with their carved initials. 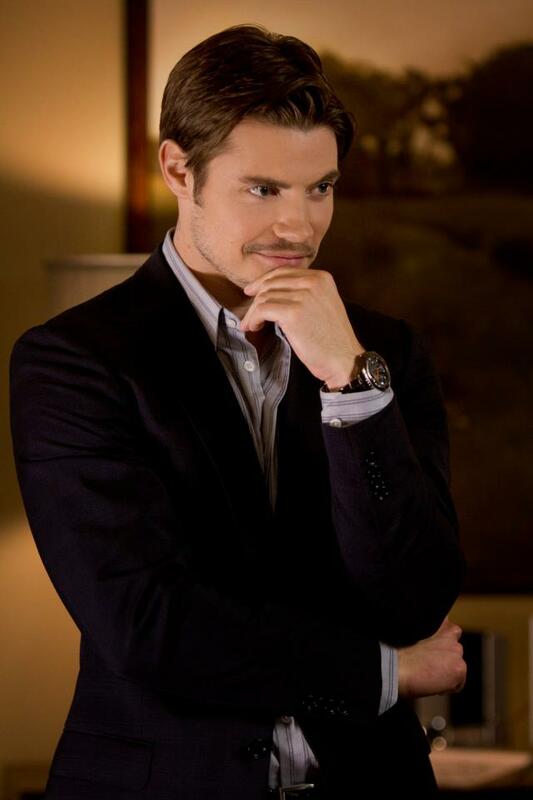 He decides to return the DVD of John Ross with Marta to John Ross and compete fair and square for Elena’s love. What he doesn’t know is that Rebecca is pregnant and has a bad case of morning sickness while delivering a peace offering of a gift basket to Elena. The beans spilled, Becca confesses that she’s nine months along and apologizes to Elena for throwing up in her bathroom. When Christopher drops by to reconnect with Elena, she blurts out Rebecca’s secret. The timing for them will never be right, Christopher sadly observes. When he confronts Rebecca, he demands a paternity test and a hurt Becca lashes back by reminding him how his birth parents Kristin Shepard and Jeff Faraday callously gave him away. At the hospital later, Rebecca apologizes for bringing up such a sensitive subject for Christopher but all he can think about is how this turn of events is ruining his chance to reunite with Elena. When Rebecca’s doctor informs Christopher, Bobby and Ann that Rebecca is having twins that are indeed Christopher’s, he is overwhelmed with emotion, but can’t fully share the moment with Rebecca. Ann is also overcome by the scene. A terrible secret has been weighing heavily on her and it’s making it hard for her to watch Christopher treat Becca so callously. She watches a young mother interact with her daughter in a playground and tells Bobby she’s shopping. Something’s up and Bobby may soon discover what’s eating her. The Dallas police arrive at Southfork to arrest Bobby for striking Harris Ryland and Bobby learns from his detective that Harris will drop the assault charges in exchange for an apology. Bobby is far more interested in learning what his detective has unearthed about J.R.’s shifty private investigator, who apparently has a rap sheet. Bobby apologizes to Harris but warns him he’ll do much worse than slap him if Harris hurts Ann again. A smug Harris tells Bobby he doesn’t really know his wife and gives him an envelope with contents that will expose her mysterious secret. Bobby, ever the gentleman, tells Ann she can confide in him when she’s good and ready and tosses the envelope, which contains photos that appear to be of Ann with a baby girl, in the fireplace. In Vegas, J.R. learns from his detective that Cliff’s right-hand man, Raheed Durani, was practically raised by Cliff without having the legal benefit of being adopted, which makes him susceptible to bribery, J.R. notes with a devilish grin. Back in Dallas, John Ross is struggling to put out fires left and right only to be confronted with a raging inferno. Unable to convince Bobby to let him proceed with drilling on Southfork, John Ross offers his cousin Lucy Ewing a significant share in the new Ewing Oil if she convinces her dad Gary to side with him on the issue of drilling on the ranch. Lucy perks up at the prospect of getting a cut of John Ross’s action but sides with Bobby anyway. The sharks start circling closer to John Ross when he’s out for dinner at a pub with Elena and notices Marta stalking them outside. He rushes to the sidewalk to confront her but is summoned to a meeting with Vicente Cano, who’s losing patience waiting for the oil from Southfork. To buy more time, John Ross squeals on Marta, telling Vicente that she skimmed off the profits from the Southfork sale and asking him to get her off his back by scaring her. Vicente agrees to intervene with Marta and gives him one more week to deliver the oil or he’s taking over Southfork! A desperate John Ross turns to Sue Ellen again and she convinces Elena to lend him some of her oil barrels to fend off his backers. Marta Del Sol fell for John Ross, quite literally. When Sue Ellen leaves her lunch appointment with Elena, we see that Marta has been watching them. John Ross calls Elena’s cell phone and Marta answers, demanding that he meet her at a hotel or she’ll harm Elena. John Ross arrives at Marta’s room to find that she had only stolen Elena’s phone to force him to get Vicente’s goons off her case. John Ross notices she’s videotaping their encounter and grabs Elena’s phone out of Marta’s handbag. Marta lunges for it, too, and scratches him on the back of his neck when he pushes her away. As a fuming John Ross heads to the elevator, two menacing goons walk in the direction of Marta’s room. To John Ross’s horror, he arrives at the sidewalk to discover that Marta was given a one-way trip down to the street without the benefit of an elevator ride! John Ross turns away from the sight of her battered body lying on top of a parked car and drives off as a couple looks on. When Elena greets him at Southfork with the good news that she’s helping him with her oil, his relief is cut short by police officers who have returned to the ranch to take him in for questioning in the murder of Marta Del Sol!